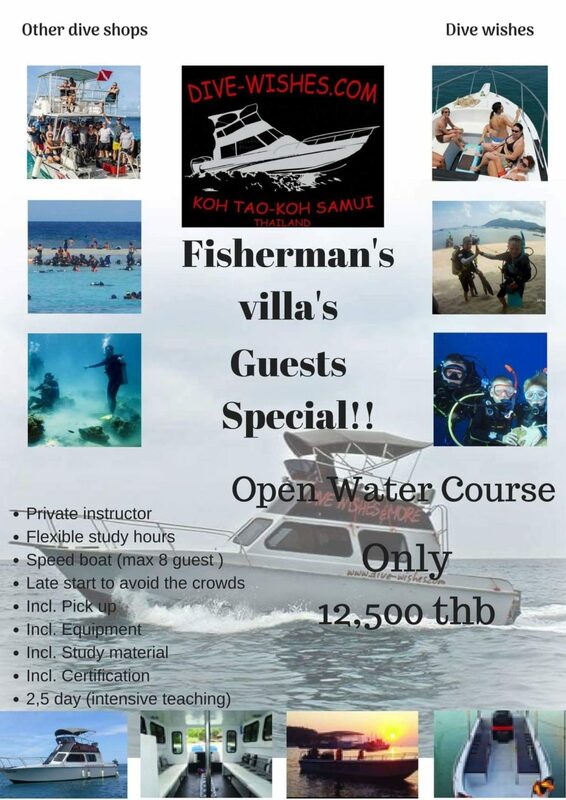 The Fisherman’s Villas consists of six detached and modern houses which are located high up on a cliff overlooking the sea towards the nearby beach Thian og Bay (Shark Bay) and the Ang Thong National Marine Park on the south eastern tip of Koh Tao. The Fisherman’s Villas offers cozy self-catering villas with stunning ocean views. Each house has stunning views. All villas has its own private infinity pool. The sleeping space in our houses are for 2-6 guests. To convey a luxurious and comfortable living for guests who come to stay, the detached villas are well equipped with modern facilities and tastefully furnished and decorated with ornaments from various parts of Asia. All villas except The Squid House, have flat-screen TV. There are bathrooms in each villa, all with shower and hot water. All villas have in and outdoor lounge areas, air-conditioned bedrooms and well equiped kitchen, with for example a coffee mashine and a shaker. To provide our guests the best service, we will inform you that we can book massage in the house and we have our own full service Dive shop- operationel ”in House”, our own boat runnign for sorkeling trips around the island, our own chef for private dining in the villa – Thai/western food availiable, our own restaurant with delivery breakfast. If you like to book anything of this before you arrive, please send us an email, so we can arrange for you. During your stay with us you can book and use all service on site. To provide our guests the best service, we are proud to inform you that we have our own fully operationel ”in-house” Diving center. Dive wishes & more has been taking care of our in-house guests since December-17 to our great satisfaction and we are happy for the succesful cooperation. Our main concern is the individual care and well-being of our guests, therefore we are happy to have found a suitable partner. THIS IS A SPECIAL OFFER FOR OUR GUESTS ONLY!! 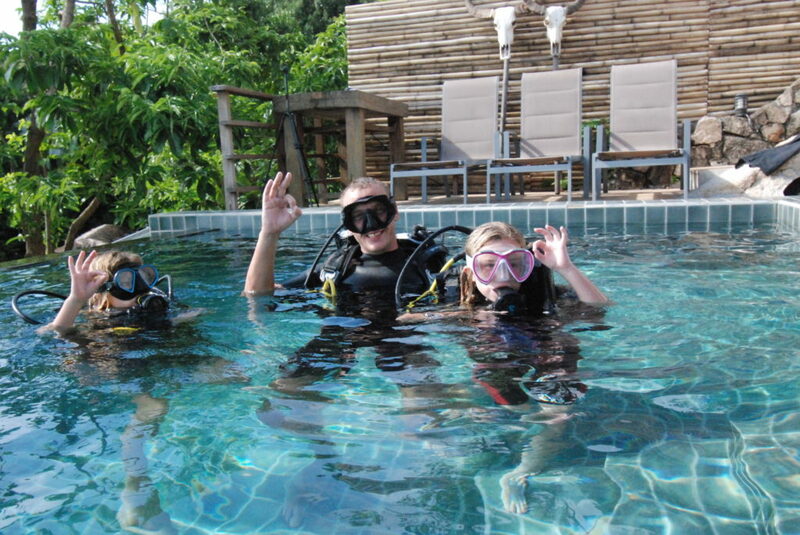 Dive wishes & more is the perfect combination for quality Villa accommodation and water activity. We can offer you a private villa for 2-6 people with your own private plunge pool and with a lot of different water activities. All sessions on the water is with a speed boat. All equipments are included, pick up and drop off at the villa. Everything is possibly, just send us a mail and ask for what you want. The villas are situated about 400 meters from Shark Bay, an area that is popular for snorkeling and diving. Close by there are two own jetties that are perfect to use as a base from where to diving and snorkeling. Within 300 meters from the villas you will find a restaurant as well as a spa and a diving centre. Tian Og Bay and Sai Daeng Beach, the two closest and very beautiful beaches are reached within a 10-15 minute downhill walk. Some parts will be steep. There are restaurants on both the beaches that serve both Thai food and burgers. Within a 20 minute drive you will find a wide choice of restaurants serving local dishes and international cuisines. The Fisherman’s Villas is located less than 4 km from Sairee Beach and just 7 km from the island Nang Yuan. Mae Haad Pier is a 15-minute drive away, and Samui Airport is 62 km from the accommodation. The Fisherman’s Villas is an excellent choice for independent travelers who like lush nature, romantic places and the stunning views of the mix of land and sea from the private terrace. As this accommodation is situated away from the busier parts of Koh Tao it is truly a place for you to relax, stress down and just enjoy the view. The Fisherman’s Villas are suitable for couples, families as well as groups of friends. We have English, Polish, German and Thai speaking staff onsite to assist you during your stay.